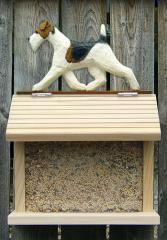 Western Red Cedar bird feeder with mounted dog on peak. House measures 11 1/2" x 7" X 10". 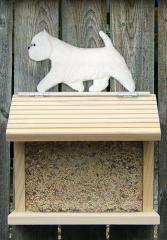 Feeder hopper is designed to keep bird feed dry. Dog measures 11 1/2" in length (Bird seed not included). 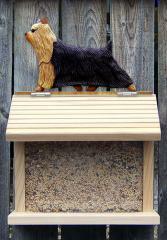 Bird feeder can be mounted on a fence, side of a building, tree, etc. Wood will turn a gorgeous grey as it weathers. Hand painted. Made in USA.